First, for anyone who thought that yesterday's post suggested a "dislike" for Sockotta, that wasn't the case. I've worked with it before, it's a bit "stiff" while knitting, but nice and soft once washed. I'm really enjoying how this one is working up. While on the topic of "other points of view", we watched Cast Away last night. It's the first time that I've seen it since learning to knit. See the sweater around his shoulders in this photo? When he cuts up his pants to wrap his feet, I couldn't help but think that he should boil some water and make some felted slippers. It struck me funny that felted slippers was the first thing that I thought of. Alas, he didn't have a pan to boil water. I've never formally announced it, but while doing inventory for Ravelry I decided that for Summer of Socks I would only work with non-wool yarns. I had skeins for six pairs: two Regia Bamboo, two Sockotta, one Panda Cotton, and one TOFUtsies. 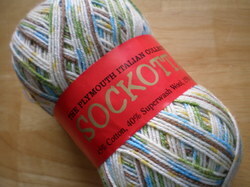 Yesterday it was time for the first of the Sockotta. This one is from this spring's "Surprise Birthday Knit Camp". It was the ONLY skein of yarn that I purchased on that trip. First, let me say that it is enjoyable to work with. HOWEVER, the two recently completed pair with their mixture of bamboo and cotton have left me spoiled. What a difference that tiny bit of bamboo makes; the yarns were much smoother. That just means that there is now inspiration to make quick work of the two skeins of Sockotta. How soon can I return to the smooth texture of the cotton/bamboo blend? Discipline...going to need discipline. My mailbox has been a delight to visit the past few days. Real mail amongst the usual clutter of bills, junk mail and credit card offers. (Someone recently blogged about mailing the BRM envelopes back to the companies. Brilliant idea, I just wish I could remember who wrote about it! Was it you?) On with the mail. 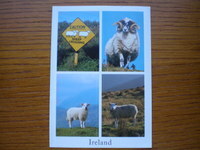 A post card from Dino. His military transport stopped in Ireland en route to Iraq. He managed to see this, think of us, and ship it off. Cool,eh!?! Cool...there's a word you don't often see in association with Iraq...in July! The heat there is hellish. Think cool thoughts for Dino please. Note cards, a magnet and some super-sized postcards from Lixie, one of my SP10 group. Go wish her well...she's getting married this week. Speaking of wishing pals well; Purple Jen is having a contest that ends on the 31st. She's still waiting for her final SP10 parcel and now is waiting to hear from fellow bloggers. Play along ("What's your favorite knitting word?") if you'd like. My Coffee Swap parcel arrived. My pal was Knitting Knurse. She has been extremely busy with moving. I totally understand how life sometimes gets away from us. She appreciated the extra understanding since parcels were to be received by June 22nd. 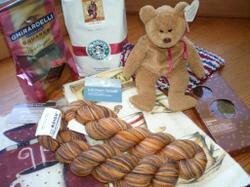 Look, coffee towels, coffee chocolate, a dishcloth, Beanie Bear, raspberry Giradelli chocolates, and coffee colored Koigu. A Chevron scarf may be just the thing. These two will need to go on a shopping trip for a contrasting color blend...any color suggestions? Thanks. Finished...with HP7. Thanks for all the advice to do so! Thanks for all of the well wishes for Matt's health. His chest tubes came out today and is on the mend. The #1 reason for the trip revolved around a certain book. Matt and Panda have been planning for weeks to be at the midnight release. Unfortunately, there was no knitting during those 90 minutes. Unfortunately, Coupling's pattern was not "mindless" enough while we waited for word about Matt. 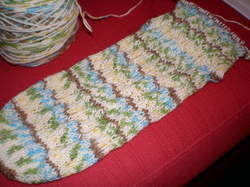 However, the second sock was started and made it all the way to the heel. Now the struggle begins...read or knit...knit or read? Matt's finished reading. Then again what else can he do with broken ribs! This past weekend was a mini-vacation for us. All last week, I was busy with preparations at home and at work in order to hit the road Thursday afternoon. We left home full of excitement for our long-anticipated weekend filled with geocaching, Harry Potter, and lots of jet-ski and dune buggy fun...oh yeah, and a 6 hour car ride with ample knitting time. 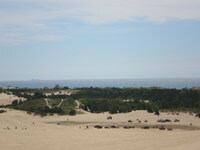 Silver Lake Sand Dunes are a favorite of ours when we visit the Mi Cousins. 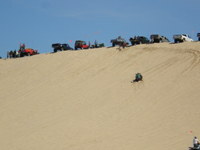 The sand, the beach, and plenty of dune buggy rides. Such an AWESOME place!!! It's exhilirating! Last summer even Grandma went for her first dune buggy ride at 92. Life is full of hills and valleys. Life has its sweet and bitter. Life, some say, is like a roller coaster. Saturday was no different. After our first run in the dune buggy...Doogie, Special K, my cousin and her husband, and me...with their youngest son Matt (Panda's birthday "twin") following on his quad/atv/4-wheeler, went for a second run through the dunes. This family has been riding for 35 years! This is what their kids grew up doing. Coming over the 3rd ridge, something happened. 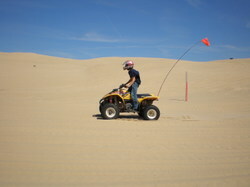 No one witnessed the actual accident, but Matt ended up flat on his belly on the dune, nearly 20 feet from his quad. He wasn't moving. He WAS breathing. But, he wasn't moving.! A wave of relief washed over us all when at long last his feet moved!!! But then....possible internal injuries, possible spinal injury, airlift to a hospital 90 miles away, CT scan, broken ribs, punctured lungs, chest tubes, possible perforated liver....all kinds of horrendous facts and possiblities swirled with each passing minute for the next 17 hours. In the end, Matt broke ribs and punctured his lungs; it could have been SO much worse. We are all so VERY thankful!!! Of course, it was not the weekend we planned, but it was a weekend we'll never forget! Note: Before anyone comments about the dangers associated with ATVs...1) Witnesses have confirmed that there was NO hot-dogging going on. 2) If you "live" life, there are risks. Even those of us who choose to knit could risk our health: carpel tunnel, potential heart problems associated with sedentary life-style (I'm back to walking BEFORE knitting! )...so please don't go there. 1854 - The Republican Party of the United States is organized in Ripon, Wisconsin. I'm not tagging anyone...consider yourself tagged if you'd like to play along. 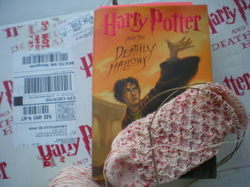 My Owl Post is here!!! Who sent it? Carol sent the owl. Look at those Ravenclaw socks. I LOVE them!! I love the fact that the toes, heels, and cuffs are fraternal instead of identical!!! Carol was my SP9 spoiler so she KNOWS of my affinity for Shaun the Sheep. 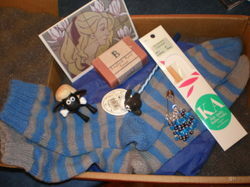 Instead of Potter items, she sent my other favorite Brit...a pen topper and a wind-up walking Shaun. The English Rose soap made everything smell so wonderful when I opened the parcel! Carol knows how to get right to the heart of things. Thanks again pal!!! Has the world got you down? Need to work on something bright and cheerful? DIY has something new to share...Knitting with a Mission. 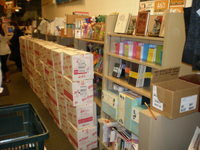 Then again, maybe stashing/hoarding is more your style. I'd be willing to guess though that your stash is not NEARLY as large as this woman's!!! I've said it before and I'll say it again...Holy Crap!!! 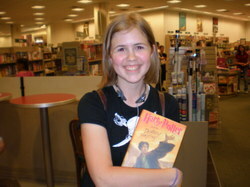 Since this is the week of Potter, I can't go without something Potterish to share. Did you get your Potter stamps? 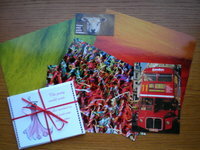 As soon as Royal Mail posts them here, I'll share a photo or two. But, for now, I'll leave you with this photo. Thanks to my brother for sharing...he's rather fond of this variety of reptile!